If your legacy backup software isn’t meeting your application needs as the infrastructure evolves—and the types of devices needing support expands—you’re probably looking to switch between backup platforms. However, the approaches with which businesses have previously done this—full data copy migration, managed services, and small instance—can quickly escalate in terms of service cost and time to execute. Not to mention the risks your team must assume if data is lost during migration. 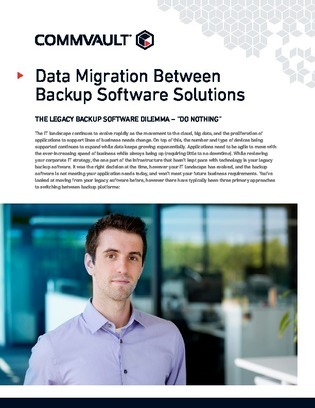 This paper presents an alternative approach to migration between backup software solutions, one which includes a portfolio of service offerings for every migration stage and can be tailored to your data. Reading on will help you understand all your migration options.